Disagreements between scientists and government officials over the predicted effects of climate change have delayed the launch of a major UN report. Several delegations at a meeting of the UN climate panel in Brussels have asked for the final version to reflect less certainty than the draft. The report is expected to say climate change is already having major impacts on the natural world. The panel believes there is also a discernible impact on human societies. But as delegates talked past dawn, some of the detail was reported to have been taken out of the final wording. Correspondents say the US, Saudi Arabia, China and India were unhappy with the strength of the language in the draft summary, due to be released by the Intergovernmental Panel on Climate Change (IPCC). "The Europeans want to send a strong signal. The US does not want as much quantification," one official told the French news agency AFP. Since the IPCC's last global assessment in 2001, the amount of scientific work on observing and collating changes to the natural world has vastly increased. In parallel, computer models which project the Earth's climatic future have grown ever more sophisticated, though there are still uncertainties in their forecasts and they remain unable to model some physical processes accurately. The combination of more observational evidence and better models allows scientists to paint a much more detailed picture of what is happening in different regions of the world, and what they believe is likely to happen in the future. "What we find is that evidence of the impacts of climate change is much sharper, much more reliable," said IPCC chair Rajendra Pachauri. "Many of the uncertainties have been resolved; and they confirm that the poorest of the poor are most likely to be hit by the impacts of climate change." Fresh water is perhaps the most serious issue for human societies. The world's great mountain ranges, such as the Himalayas, Rockies, Andes and Alps, act as natural reservoirs, trapping winter rain and snowfall as ice, and releasing it gradually in the summer. Evidence suggests that glaciers are shrinking in all of these ranges. One recent study predicted that 75% of Alpine glaciers would have vanished by the end of this century. 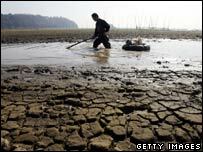 As the ice disappears, spring and autumn floods become more likely, with an increased risk of drought in summer. The IPCC is expected to say there is "very high confidence" that these trends are already occurring. It will also project a higher risk of flooding for many major cities on or near the coast. Some observers of climate issues have long maintained that action on climate change should focus on protecting societies and natural systems against impacts such as floods and drought, rather than on curbing greenhouse gas emissions. The IPCC, however, is set to conclude that "adaptation alone is not expected to cope with all the projected effects of climate change, and especially not over the long run as most impacts increase in magnitude". Poorer societies are likely to be hardest hit, as they lack the resources to set up protective measures and change their economic base. Adapting to climate impacts, in the IPCC's view, should go hand in hand with reducing emissions. This is the second in a series of IPCC reports coming out this year, together making up its fourth global climate assessment. The first element, on the science of climate change, was released in February, concluding it is at least 90% likely that human activities are principally responsible for the warming observed since 1950. The third part, which comes out in May, will focus on ways of curbing the rise in greenhouse gas concentrations and temperature.